Just like any other fashion conscious girl, I LOVE RINGS! I don't normally wear them out. I just find them an inconvenience sometimes especially those large cocktail rings (like the black gem one above) but they're the ones which have the biggest impact upon ones wardrobe. I used to just buy and collect rings, never to wear them, only to decorate my room. After watching Rachel Zoe sport massive rings in her daily outfits, it made me realise that rings aren't that much of a hassle in terms of practicality, you just have to get used to having a rock on your finger (literally the weight of a small rock(!)). So above are my lastest finds which I am in love with! I wish I had found the first ring (the one with the blue stone) sooner so I could have worn it with my summer outfits. 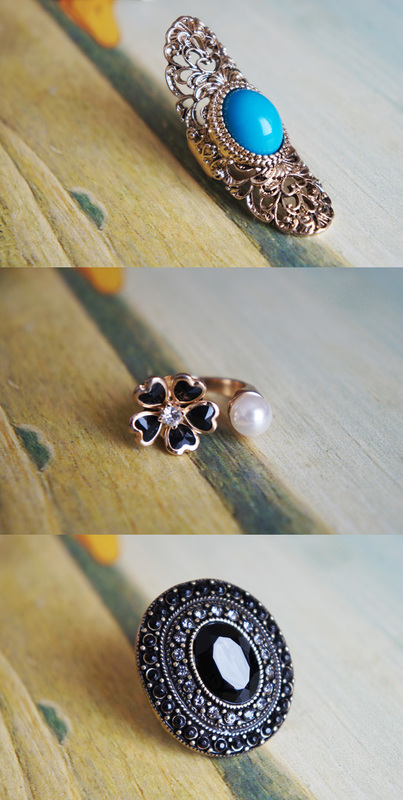 The second ring is just so pretty, I needed some pretty jewellery for when I decided to... be pretty...! The last one is what I have been looking for for a while, a statement chic piece which can add instant glam to my wardrobe and I think it goes with pretty much everything. The best part about the rings isn't that they are freaking awesome, it's that they were super cheap so even if you lost them, a friend did a long term borrow or heaven forbid someone stole them, you could replace them at an instant! I love the first one, the color is so vibrant. My fear is that my finger will not be able to bend after putting it on! I love wearing rings but sometimes feel they are such a hassle. These are beautiful nonetheless, thanks for sharing! lol Im just like you hun. Dont wear rings (or any jewellery for that matter) at all lol. BUT in saying this there have been times where I have been deliciously swayed. I see here you've found your achilles heels in rings lol. They are very lovely btw ^_^ The hint of turqoisine and ombre is just gorgeous =) Great picks! I like so muhc those rings!